As dawn rose over Lake Evendim, Caethir groaned and willed his eyes to open. It had been a clear night which, although beautiful had meant the stone floor on which he had his roll mat was colder than usual. The Elf felt like all his body ached, as if the weight of all he had set out to do for the Wardens still rested on his shoulders. Forcing himself into a sitting position, he shivered and pulled the roll mat back over his knees. He rubbed his eyes and glanced out over the clear waters. To the North were some beautiful hills he had yet to explore and would do so once he fulfilled his pledge to return. To the South, Annùminas. Not much more needed to be thought about that, other than his “Shield Sister” (as he often thought of her) would fare a lot better than he, especially with her Elven partner as her side. There were soft murmurings coming from one of the newly-lit camp fires as Wardens, travellers and trades-folk also attempted to awaken their senses to start a new day. Standing to his feet, Caethir wandered over to one fire, where some cooking smells were emanating from a huge iron cook-pot suspended over the flames. The smell was not entirely unpleasant, but it did not awaken the taste buds as the elk of the previous night had done. A traveller passed him a crude wooden bowl and spoon, to which the Elf inclined his head in thanks. Reaching for the enormous ladel he scooped some of the oats and berries into his bowl, realising he was both hungry and would require energy for the first stage of his pilgrimage. “I will return these shortly my friend,” Caethir assured the stranger. The Elf managed one of his wry, half-smiles and turned back to his roll mat. Picking up a linen cloth and some comfortable clothes, he headed to a secluded spot on the edge of the lake to enjoy breakfast and take a much-needed wash.
An hour later, the Elf felt refreshed, though his body felt confused – being heated inwardly by the oats and berries, but chilled outwardly by the Lake’s waters. But his head was clearer and that’s what mattered. Having washed and returned the bowl and spoon to the tradesman, who seemed content with not moving his wares on this occasion, Caethir headed back to his steed and began packing things into satchels and saddlebags. He had changed his clothes into comfortable travel-wear, not the more durable gear he usually took into battle. As he was packing the final things he heard a voice behind him. “I hope you aren’t running away just yet?”, the female’s voice chimed. The Elf smiled and turned around. She looked different when not in her heavy armour, choosing a loose, brown tunic. She still had her elegantly-fashioned sword by her side, forged by a Dwarven friend they had spent far too little time with. But she seemed more relaxed and at ease with herself, much how Caethir himself felt now he was out his own battle attire. “N’wyn! I heard you had been…slashing your way up here,” he said smiling. “One has to make an impact, I believe you said.”, she laughed. “And that you did, Sister. You made good time,” Caethir noted. Caethir nodded, hoping they might get the chance to fight together once more, maybe in the war against Annùminas. “I just wanted to thank you,” the Elf began, but N’wyn interrupted him. They exchanged a look, neither quite sure how to depart. Caethir turned to his saddle bad and pulled out a ragged piece of parchment, on which he had roughly drawn his journey up here. Flattening it against the side of his horse he stared at it to work his way down South. The girl came alongside him but kept a respectful distance from Caethir, knowing he usually needed a little space. Brushing her ragged, brown hair out her eyes she examined the map. “Ha! You came from Oatbarton, how long did that diversion take?”, she laughed. The Elf rolled his eyes and sighed. “And that’s why I came into Evendim from the East! Now, your comment about going backwards, may I?”, N’wyn gestured to the map. Nervously, Caethir relinquished his hold on the map which was swiftly torn into neat sections by his friend before being thrown into the air. The breeze caught them and they were soon carried from view. “Do not start this journey thinking it is a regression, Caethir. What reasons did you give me for this quest?”, the girl asked seriously, arms folded. “To re-find myself and to start to become the Elf I am supposed to be.”, Caethir murmured humbled by the serious act of his usually joyous friend. “I guess I am.”, the Elf responded, a dawning realisation igniting in his mind like some tinder newly aflame. Caethir had to smile at that. Doing stupid things had nearly caused his death on numerous occasions in previous times of his life. But he needed to change the subject. “The Wardens here know who you are to me and that you are here in my stead. I also swore by oath to return to them. You’ll fit in here no problem, so, thank you” he managed, painfully aware he should be on the road. “I will also hold you to that oath, Caethir. When you reach somewhere vaguely civilised, please try to get a message to me.”, N’wyn pressed. “And there’s the Caethir I know. No go on, before your horse decides to do its own thing.” N’wyn reached up and stroked his horse’s nose, who breathed his warm breath back at her. Caethir, put a foot into a stirrup and hauled himself up into the saddle. “Where will you go first?” the girl enquired squinting up at her friend, the bright morning sunlight dazzling her. “Of course. I should go.”, he stated rather too shortly, a sudden sadness as this separation threatening to assail his heart. N’wyn reached up and grabbed the Elf’s hand and gave it a quick squeeze, before releasing it back to the reigns. “I’ll be here when you return,” she assured. Pulling gently at the reigns, Caethir turned towards the eastern brige, which would connect him to the Southerly route to High King’s Crossing. With a backward glance at his Shield Sister, he gave his horse a gentle kick to begin his journey. No, he would not be retracing a journey – he would be mapping a new one. “I always hate it when she’s right,” he muttered as turned off the path to ride across the green hillsides of Evendim. 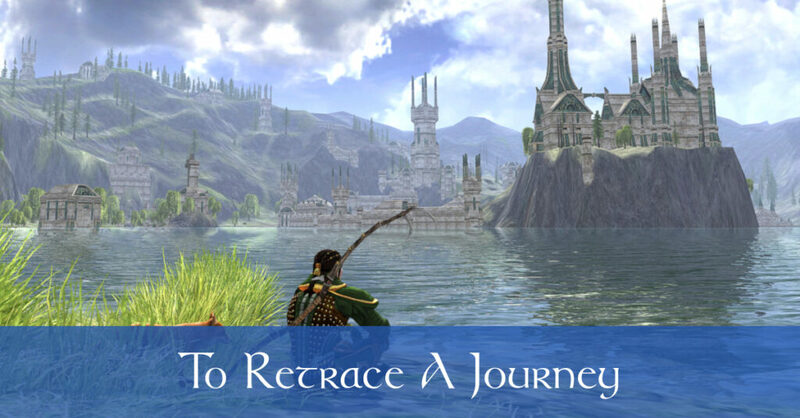 15:18 February 27, 2019My Top 9 LOTRO Plugins – Enhance Your Gaming Experience! My Top 9 LOTRO Plugins – Enhance Your Gaming Experience!